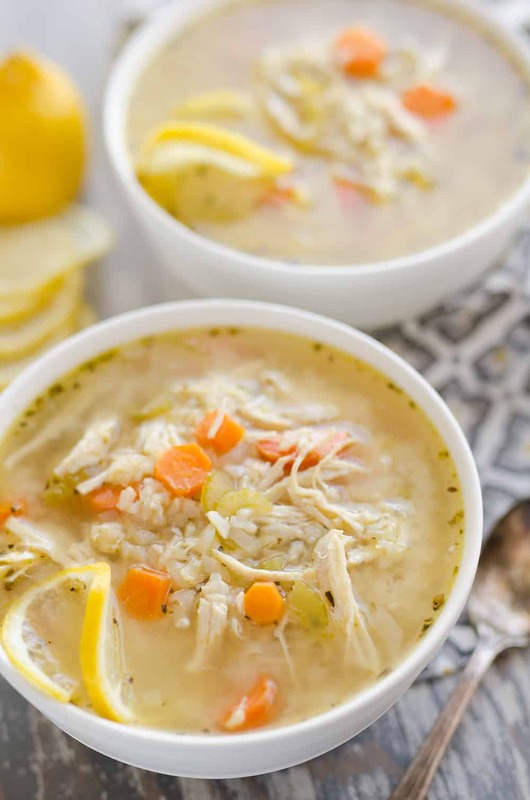 Pressure Cooker Lemon Chicken & Brown Rice Soup is an easy and healthy recipe made in your Instant Pot. The lemon twist on this classic chicken noodle soup recipe is light and refreshing, perfect any time of the year! Chicken noodle soup is a classic comfort food that just about everyone has enjoyed from childhood on. 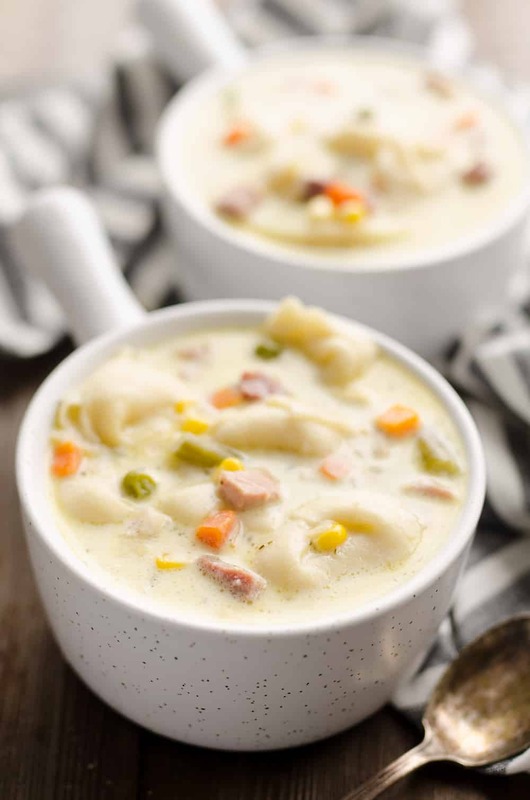 Whether you are feeling under the weather or are just looking to warm up with a yummy bowl of soup, it is a go-to for all occasions. I was craving some chicken soup, but I wanted to speed things up and make them a little bit healthier. 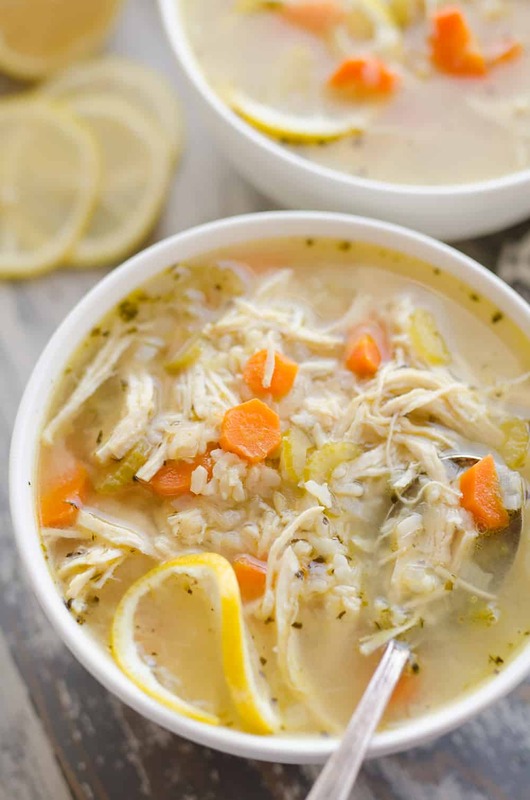 I decided to use my Instant Pot to make this Pressure Cooker Lemon Chicken & Brown Rice Soup. The lemon twist is light and refreshing and perfect for summer. I opted for brown rice instead of noodles to make things lighter and healthier. Brown rice is also great in this recipe because it takes the same amount of time to cook in your pressure cooker as the chicken. If you were to use white rice instead, you would be left with mushy rice. You gotta love the Instant Pot for cooking because you can can make everything right in one pot. I am all about the easy cleanup. 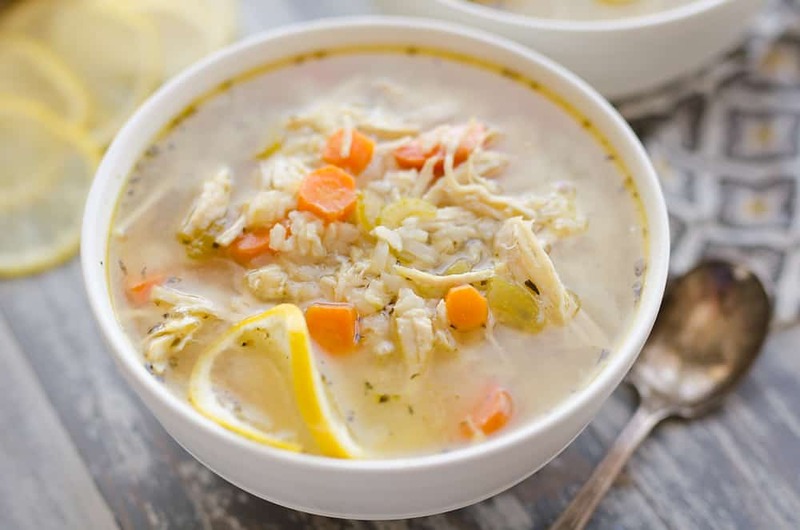 For this Pressure Cooker Lemon Chicken & Brown Rice Soup you just saute up the onions in a little butter or oil and then toss all the vegetables and boneless skinless chicken breasts into the pot. Cook it for 10 minutes and allow for a 10 minute natural release. When everything is done cooking, just remove the chicken breasts from the pot to shred them up. Either use two forks to shred them by hand, or if you are in a pinch for time, toss them in a bowl and use your beaters to shred them up extra quick! Be sure not to skip out on the Better Than Boullion. It is a great ingredient to add to any chicken based soup for an extra kick of flavor. It will be missed if you don’t include it. You can find it in just about any grocery store by the canned broth section. Turn your electric pressure cooker to the saute function on high. Saute the onions in the butter for 2-3 minutes, or until translucent. Add the garlic to the onions and saute for 1 more minute. Add the remaining ingredients to the pot. Cook on high pressure for 10 minutes. Allow the pressure to release for 10 minutes and open the valve to vent. Remove the chicken breasts from the pot and shred using two forks or in a large bowl with a hand mixer. Add the chicken back to the soup and serve with additional lemon slices. 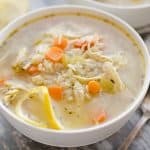 More great pressure cooker soup recipes! I’m excited to try this!!! Another Instant Pot recipe!! Thanks! 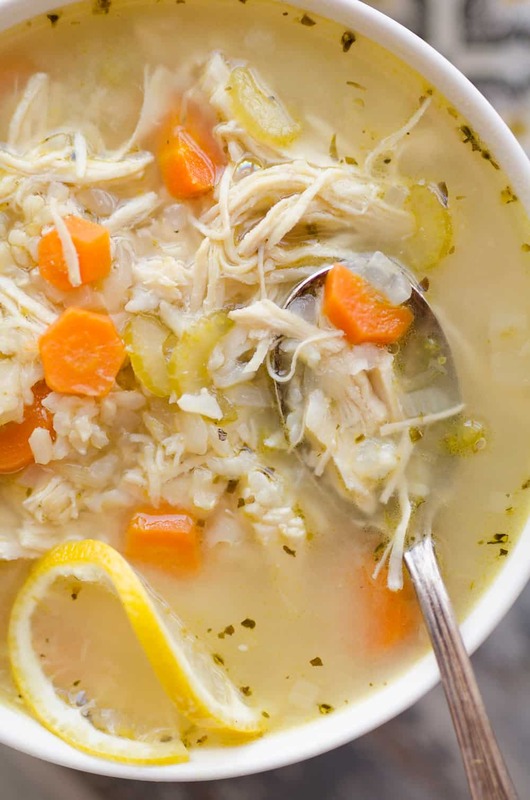 This soup sounds so amazingly delicious with the lemon! I need to make this ASAP! I love the idea of adding in lemon! And I love using better than bullion! This looks perfect for a summer dinner! The lemon really brightens this up! Love it! Hey! This recipe looks so yummy! We are a family of three so I would like to half the recipe, how would that affect the cooking time? For a soup it is fine to half the IP recipe and keep the same cooking time. It makes great leftovers though! Made this tonight, it was very good, however I’m worried that this recipe may cause an accident. I have a 6qt duo and after all the ingredients were added it was above the MAX fill line. It took longer than 10 minutes to come to pressure, but did eventually. I did a controlled quick release, because it began spewing hot broth from the vent, I had to reseal the vent, and slowly release. I suggest using an 8qt to avoid any possible accidents, but with that being said the flavors were nice, could have used a touch of salt, but over all very nice. Hi Crystal, yes if you are using a 6 qt. you will want to add some of the broth back after it cooks so it doesn’t go over the Max line! This chicken soup looks really good! I love the pairing of herbs and lemon with the chicken. And it looks quick and easy to make. The instant pot is for sure useful and handy you can cook almost just about anything in it. And being able to cook everything right in one pot is the best way to do it! Has anyone tried making this with frozen chicken breast? I’m new to the IP…would i still cook it the same amount of time? Or change the amount of liquid? It doesn’t work to substitute white rice because white rice cooks faster so it will be mushy. If you cook it less time then the chicken won’t be done. If you want to use white rice, just leave out the rice in the Instant Pot and add in cooked rice when it is done.